Looking to buy safety vests in Rochester NY, Ithaca NY, and Western NY at competitive prices & with exceptional service? 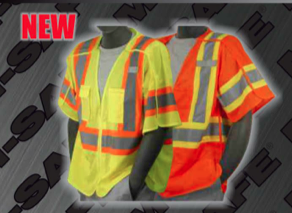 The Duke Company proudly carries the finest Safety Vests – ANSI Class 3 Break Away in High Visibility Yellow and High Visibility Orange. Five point velcro break way enables the vest to be pulled from either the sides, shoulders or front surface. Provides essential protection in the unfortunate case that the vest gets caught in machinery. Pockets include a valuable ID bade holder, pockets to hold 4 (four) pens, and radio pocket.